There is not a single Malaysian that doesn’t know the Nescafe’ coffee brand and if you haven’t, well, here is a quick introduction about the coffee mix. Nescafe’ is a coffee mix from Nestle which has been around from 1938. Their brand stands out well from the rest because of the taste, the aroma and as well as price. For something that has been around for so long, you can be sure that they have some of the most unique selling styles to maximize reach throughout the mass market. 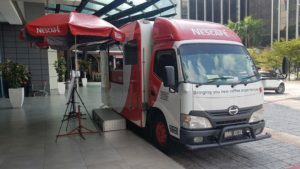 But this may prove to be more promotional than direct selling as the food truck itself didn’t stay long enough to amass a long waiting line before moving unto the next location. Food trucks are but a vessel. The key lesson here is to bring your product straight to the customer when being stationary doesn’t yield enough results. For all sales people, you must never wait for the sales to come to you. Be proactive and take your product straight to the buyer! To make your presence known to the market, go to all places especially where people gather by the thousands. Even for B2B, go to public conferences, networking sessions and programs to establish your presence and your brand. With this method, you can directly sell ANY product you have at ANY time, ANYWHERE! All that is left is perseverance and your determination to empty that truck for every sale you can grab! The new SST is approaching, and people are expected to spend less after that. So, until then, during this period of free tax, you should take advantage by selling as fiercely and as often as you can! Click HERE to register with us today so you can learn how to be as out-going and as fierce as Nescafe in a food truck!